Typifying: is this scientific approach revealing? I once wrote a brief post about the effects of the Düsseldorf school, following Grant Scott‘s article Has the Düsseldorf school killed photography? (which I can no longer find available online). At the time, I hadn’t given much thought to the scientific nature of photography, because I tend to deviate from that approach. However, as I’m accompanying a friend’s PhD about the archival nature of photography, I ended up having a lot of discussions about typifying, cataloging, archiving, stereotyping, etc. In a couple of weeks (or months), I’ll be able to write about his work, properly. For now, just some very brief considerations that came to mind while observing author Yorgos Efthymiadis‘ project Domesticated. © Yorgos Efthymiadis, ‘untitled’, from the series ‘Domesticated’. I came across one of Yorgos’ photographs from Domesticated @ Lenscratch and a strangely familiar feeling was immediately awaken: I wanted to curse the photographer’s temptation to typify!. Maybe what happens is that 1) there’s an idea – in this case how guns can be embellished to reveal only (or mainly) their function as decorative objects or ornaments; 2) the author may think that the repetition of a given formula (composition, etc) will be able to highlight the “true nature” of the project and accentuate its idiosyncrasies; 3) as the observer gets accustomed to the author’s style, he/she legitimates his/her doing. I want to suggest that behind this process lies one of the paradigms of photography – that her nature is to kill, not to reveal. 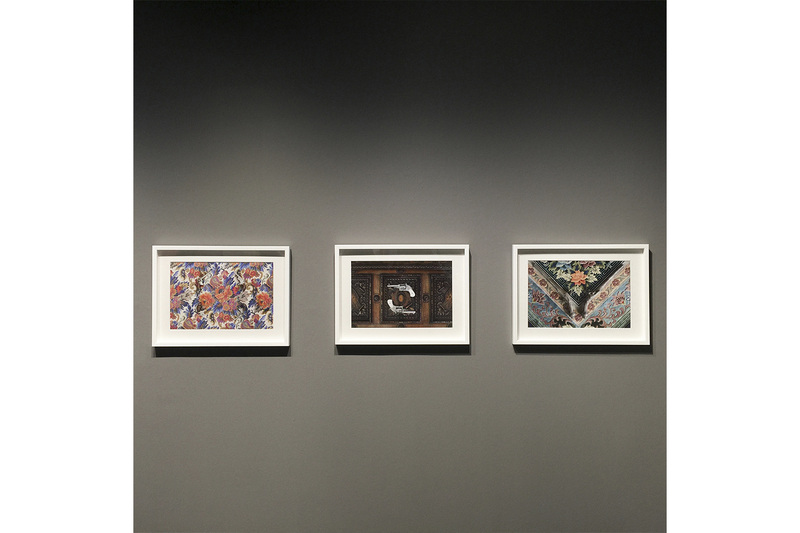 In that sense, maybe what really happens is that 1) there’s an idea – the idea is not good enough for a project (there’s nothing fundamentally original about it), but still the author insists; 2) as the formula repeats itself, instead of helping reveal the “true nature” of the object – the gun -, that repetition destroys the aesthetic dynamics of the singular image; 3) while the author intent may be to level, to particularize the object and universalize the subject, what happens is that the leveling and the repetition exposes the fragility of the initial idea. 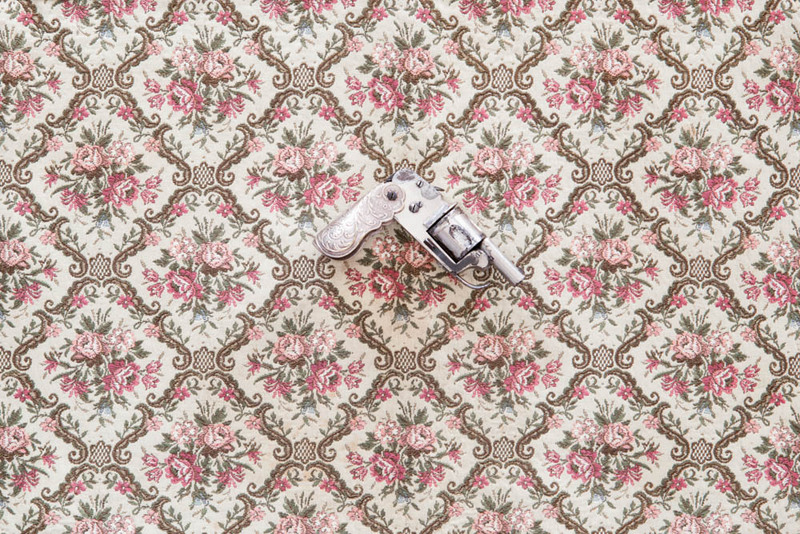 Aline Smithson comments that Yorgos project is about exploring “the charged subject of gun ownership” and in order to do that, he photographs the “collector’s prized possession in juxtaposition to a woven backdrop from the collector’s home”. Apparently, what this strategy amounts to is to reveal how guns, apart from their destructive nature, can be “just beautiful objects”, full of history. However, does this strategy of erasing the ethical nature of the process of creating art can help reveal a scientific true? Or, instead, is this just not about art?